Mockingbird Words: This is a word cloud of the words on this blog from the first week of October. I am playing around with Google translate this Saturday morning. I translated a short poem of mine into Bengali and back again. The basic poem was pretty similar, but when we got back to English, giant feather had become hairy giants. That’s extremely promising for a little bit of fun. The sentence structure of the original poem was pretty straightforward, so the algorithms brought most of the poem back to at least a sense of the original, even when I sent it through several languages before coming back to English. the next riddle will appear. It displays the following password. There’s some possibility there. As goofy as this exercise is, there’s a point here: I sometimes (often?) get caught in certain ways of saying things, stuck in linguistic and imagistic patterns. I worry that my poems sometimes begin to sound all the same. 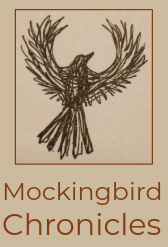 In Song of the Toad and the Mockingbird, I published several poems that were an attempt to break out of my own boxes. The results were several rather surreal poems that I am rather in love with, but which–in hindsight–I think might be somewhat unrelatable to anyone outside my own head. Perhaps my next experiments should be to break down even the structure of the words, and play with invented spellings. Vithut for without has captured my imagination. And Mata. Is that eyes? Or matter? I need to simply force myself to stop now, or I’ll be doing this until noon. 1. Wordplay. Layers of meanings in words that shift and change color, dash away, and return with whole new meanings. Connections between words and meanings and languages. 2. Imagination. This boy, who is doing his spelling homework here on the floor beside me, suddenly yelled out, “Narwhal!” He had stuck his pencil between his toes (because that’s what you do) and caught the shadow of it on the floor. It did indeed look exactly like a narwhal. 3. Yesterday’s Service of Thanksgiving at my school. Music, speech and story, visuals. Generations. The Moment, for me, was when the choir was coming off the stage. I was one of the first ones off, so I got to watch as members of a composite choir of people of all ages filed into their rows. We all felt a sense of belonging to the choir because we had all been in some form of LMS choir throughout the years. It brought 75 years of time together into one moment. Deeply moving. 4. Saturday morning sleeping in. I feel so rested and ready for the day.